To view the information PDF requires the use of a PDF reader. This can be installed for free from the Adobe website. 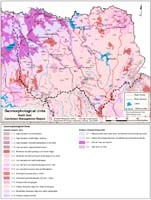 Geomorphology for the whole of Victoria is available on statewide Victorian Resources Online (VRO). Information on the geomorphology of the North East region will be developed further as it is made available by the Geomorphology Reference Group. Some initial information is available above to describe the 'Eastern Victorian Uplands' Geomorphic Division as well as pedogenic hardpans in the North East region.